I Need 12" Wide (or wider) Wood - How Do I Buy It? 12" or wider is no problem in some woods in some thicknesses. But the majority of hardwood lumber in 4/4 thickness is less than 12" wide. The majority. It's not impossible to get 12" or wider lumber, it's just not the norm. You may specify 12" or wider widths, and if we can accommodate your request we will do so. If it's not, we must ask: what's your project? Are you opposed to gluing up for some reason? Need us to glue it up for you? We can do that, too. However, understand that there's no guarantee we can provide it at all times in all woods. 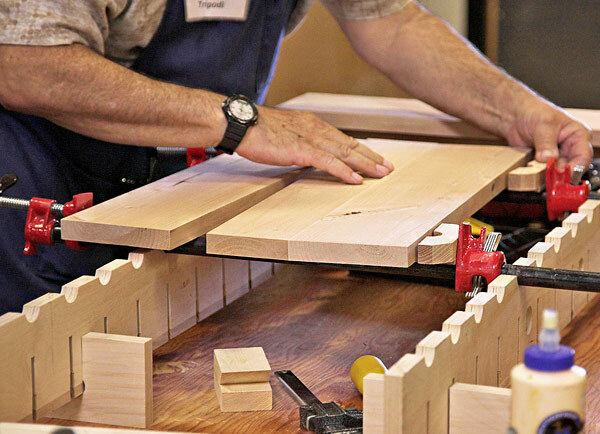 Woodworking is basically three procedures: cutting, shaping & gluing. So, the tried-and-true way to get super-wide solid wood is to glue it up from narrower boards, then trim it down to the required size. If you absolutely must have wide boards that aren't glued up, you should ask yourself why is this necessary? The wider the wood, the more likely it will contain defects. Wide solid wood will not stay flat. All solid wood expends and contract as it equalizes with its environment. The effect on wide wood is even more pronounced due to the greater number of wood fibers. Shelving, desk tops, chest lids, conference tables, and cabinet doors are just some of the projects that call for wide panels. Solid wood works as long as you know what to expect and how to deal with wood movement. Plywood can be treated with a solid wood edge that 1). allows you to rout a decorative profile, and 2). can provide the appearance of a 2" or 3" or thicker panel without the weight, the cost, and troubles of a solid wood panel of the same size. Veneer can be purchased in numerous varieties of wood, and choices like burls and figured woods are much higher and consistent in quality than what you can routinely find in solid wood. Veneer can be applied to a plywood substrate and also treated with solid edge to create the appearance of a thicker panel.